A “Blue Marble” image of the Earth taken from the VIIRS instrument aboard NASA's Earth-observing satellite — Suomi NPP. 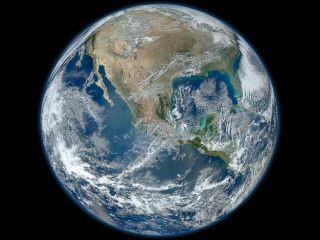 This composite image uses a number of swaths of the Earth's surface taken on Jan. 4, 2012. The effects of climate change on Earth can be seen clearly in photos taken by satellites in space, and those images are vital tools in protecting our home planet, NASA chief Charles Bolden wrote today (May 6). Bolden's comments, which were released on his NASA blog, followed the release of the Third U.S. National Climate Assessment report today by the White House. According to the report, the fallout from human-induced climate change will result in more extreme weather events, longer and hotter summers and other extreme regional effects. Some of those effects, like more frequent wildfires and coastal flooding, are visible from space. Bolden wrote that NASA scientists and missions were vital to the National Climate Assessment report, and the space agency has big plans in 2014 to continue that role. "Five NASA Earth Science missions will be launched into space in 2014 alone," Bolden wrote. "Together with NASA’s existing fleet of satellites, airborne missions, researchers, and the unique platform of the International Space Station (ISS), these new missions will help answer some of the critical challenges facing our planet today and in the future." In February, NASA and Japan launched the Global Precipitation Measurement core observatory to track global rainfall patterns. The next satellite to launch will be the Orbiting Carbon Observatory 2, which is slated to blast off in July to map the carbon dioxide in Earth's atmosphere. It is a replacement for the first OCO satellite, which was lost during a failed launch in 2009. Two of the new climate-monitoring NASA instruments will be delivered to the International Space Station. The RapidScat instrument will monitor ocean wind speeds and direction, while the Cloud-Aerosol Transport System will use light-detection and ranging (or lidar) to track dust, smoke and other particles in Earth's atmosphere. Finally, NASA will launch the Soil Moisture Active Passive mission in November to study soil moisture around the world, as well as monitor the timing of freeze thaws. "All of the data NASA collects is widely disseminated and helps many people to make wise decisions about how we care for our planet, as well as predict and cope with changes in climate and extreme weather events," Bolden wrote. "The National Climate Assessment is an example of how critical the NASA data and research are."